On Wednesday my daughter aged by about two years. It happened right in front of us, in an extraordinary transformation at exactly 8am. One moment Izzy was a fairy princess, dressed in pink and purple pyjamas whose only concern in life was Eric, her handsome prince; the next, she had become a schoolgirl. 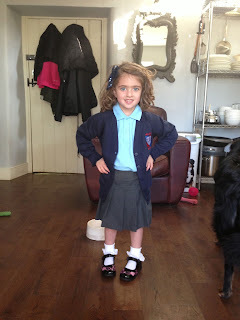 There’s something bittersweet about seeing your little one dressed in a proper uniform for the first time, her hair neatly bunched, clutching a spotless new school bag and gym kit. Of course you’re proud to see her reach this milestone, but you’re also sad to the bottom of your heart, because you know the clock can never be turned back to those innocent pre-school days where she’d happily spend an entire week dressed as Minnie Mouse. Life will never be quite the same again. It’s certainly been a shock to my system. For a start, I now have to be up on time myself. I have never really been one for early mornings. My nighttime routine would appall any doctor. I go to sleep at 1am, then usually get up at 3, work for a couple of hours with my team in Los Angeles, then back to snore soundly (according to Jo) till 10am followed by a reviving double espresso and Sky News. I’m not sure this lifestyle is terribly good for me, but it’s somehow managed to get me through the last sixty years without hospitalisation or insanity. However, it does mean that when it’s my turn to take her to her pre-school, Izzy has always managed to be the last child into the room by a couple of hours. Through no fault of her own, she’s adopted the lifestyle of a teenager: rising mid-morning, imbibing Coco Pops instead of coffee and grunting at her parents till the chocolate hits. Now, as Jo keeps reminding me, we both have a legal responsibility to get her to school by nine, and we’re sharing the burden. We all go to bed before Newsnight; our poor coffee machine is struggling to keep up with my extra early morning caffeine demands; and Izzy is having porridge for breakfast. My colleagues in LA think I’ve forgotten them. One thing I’m sure is that Izzy couldn’t possibly have a better start to her education. Our little village school is, without doubt, the perfect environment for any child’s early years. It’s not just that it’s small: with 13 in her class; it’s not just that it’s friendly – all the kids already know and like each other; it’s the extraordinary commitment and dedication of the teachers, which I’ve never really experienced before in any of my elder children’s schools, both state and private. On Tuesday, Izzy’s new teacher did the rounds of all her charges’ homes. She spent an hour with us assessing Izzy’s reading and communications skills, praising the former, politely listening to the prattling of the latter, and generally enthusing our child with the prospect of all the exciting things they’d be doing together the following day. As a result, for the first time I can recall, Izzy positively leapt out of bed and into her uniform. 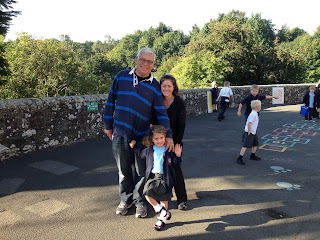 I have never seen a child so proud or excited by the prospect of school. Mind you, it wasn’t entirely straightforward. Although blue shirt, grey skirt and dark blue cardigan were donned without argument, Izzy still felt she had to make a fashion statement. Her black shoes were adorned with purple and pink hearts and bright flashing lights in the heels signaled her arrival in the playground. To think that we could have been living in London now, battling through traffic or trudging along dog-excrement-laden pavements to some overcrowded inner city school. Or, worse, forking out thousands of pounds for private education in some elite and remote establishment. There’s scarcely a day goes by that I don’t feel relieved that we made the move to Northumberland the year Izzy was born. We decided to stay here because we thought there could be no finer place to bring up a child. And now we know we were absolutely right.